May I share another Halloween tabletop with you today? It's only the second one I'm sharing, but still I don't want to bore you to tears with Halloween tabletops or anything. I never was a huge fan of Halloween until I had kids. 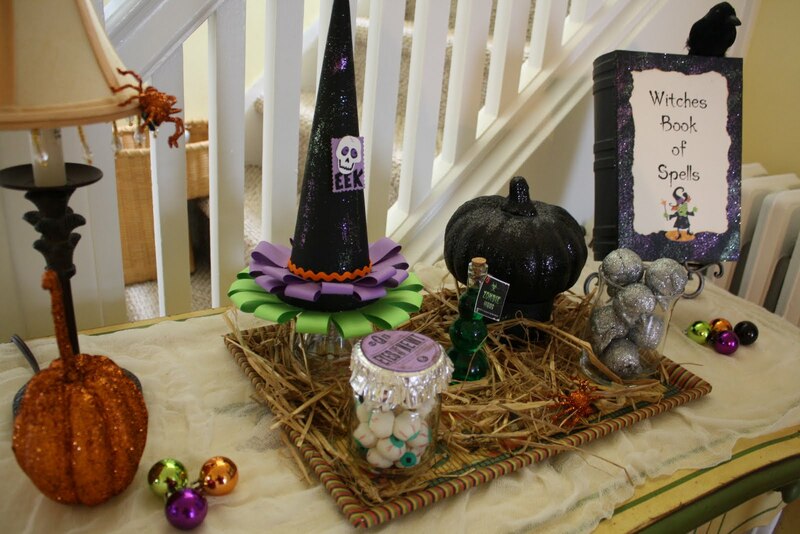 Then still, I was not a big decorator when it came to Halloween...you know...just a few things here & there that my kids enjoyed. Lately however, I find myself enjoying Halloween more & more. I have this display set up on the yellow desk in my hallway. The ever important Eyes of Newt. You never know when you might have need for some Zombie Virus or silver glitter skulls to make a potion. Watch out for that orange glittered spider! I hear they're venomous. 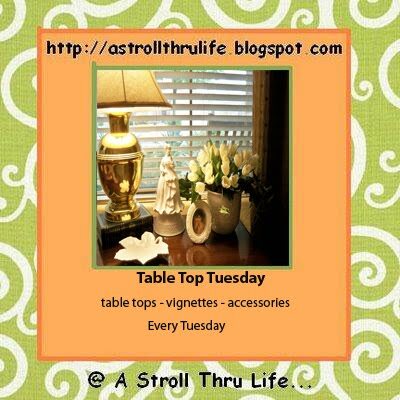 I'm linking this up at Marty's blog (A Stroll Thru Life) for Tabletop Tuesday. 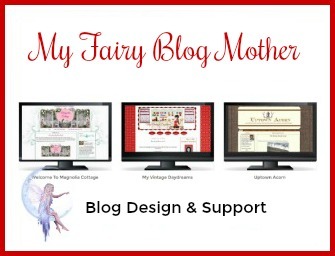 Go on over to Marty's & take a look at all the inspiration. Anyone got an antidote for an orange glittered spider bite? Ouch! 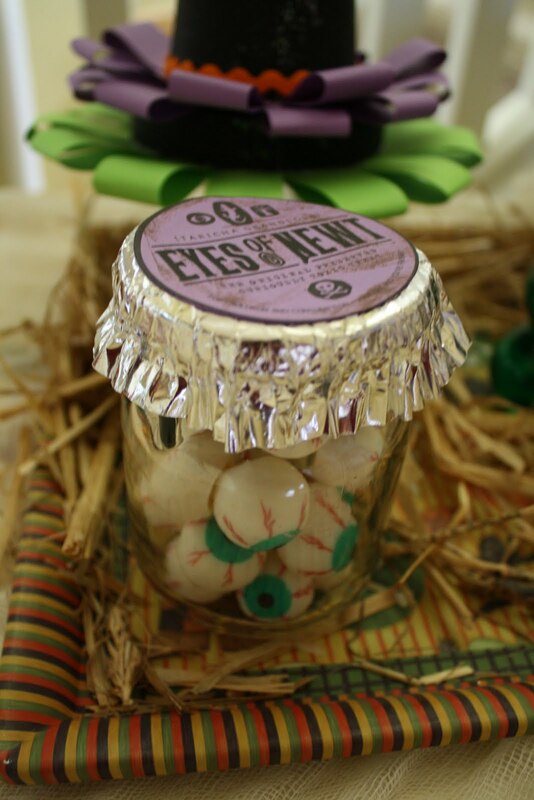 It is wonderful Gina...I am loving the eyeballs in the jar! Super Cute! 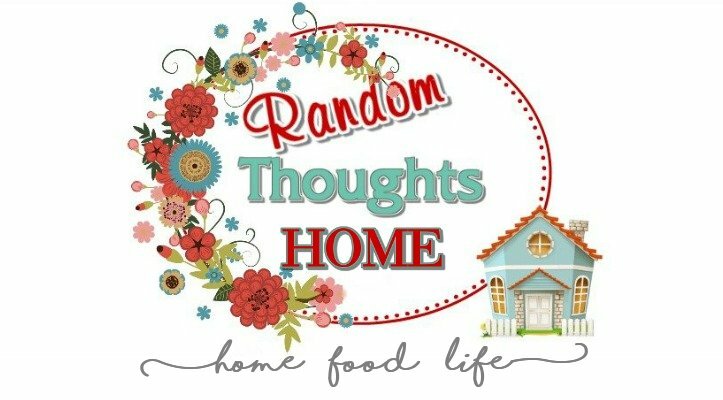 I'm with you...I think Blog Land has made us all decorate more. We see cute things and say "OH...I could do that..change this". 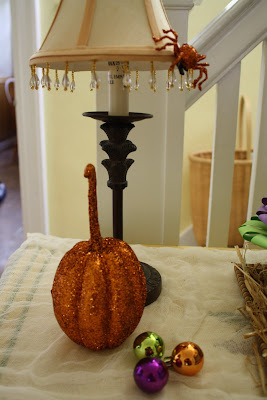 I like to decorate more for fall than Halloween but that's fun too! Happy Fall Ya'll from Houston! I think the antidote would involve an orange glittered spider and a green snake??? Great post...I totally enjoyed it!!! Gina I love it...The eyeballs in the jar are great!! Halloween is my LEAST favorite...I know I am such a witch...but I do have to say that your eyes of newt are making me change my mind. So fun! I have always enjoyed Halloween, but like you, had never been big on Halloween decorating until I had my daughter. I stopped putting up all those kiddy decorations a few years back. I came to find out that my daughter really missed me "decorating for Halloween" So I began again. I think it's lots of fun...Anyways, your yellow desk looks spooktacular. 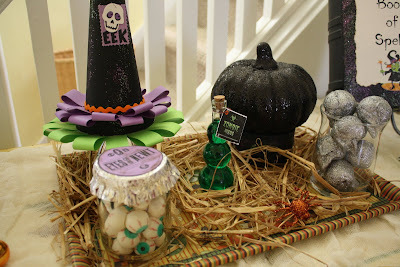 Ooo, Oooo, Ooo, And I have the perfect antidote for orange glitter spider bites....Halloween candy treats...Especially those in the chocolate variety :-) Have a wonderful day my dear friend. What a cute vignette! 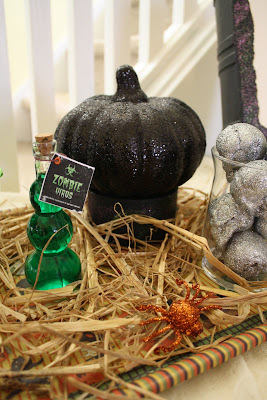 Love the potion bottles and the orange spider.